Enjoy glimpses of the third International Day of Yoga celebrations at Isha Yoga Center in the presence of Sadhguru and Adiyogi, as well as highlights from the efforts of Isha Foundation volunteers around the world to offer simple yoga technologies to people around the world. This year, Isha Foundation is especially focused on reaching out to the students and soldiers of India. The third International Day of Yoga was celebrated with great enthusiasm at the Isha Yoga Center. 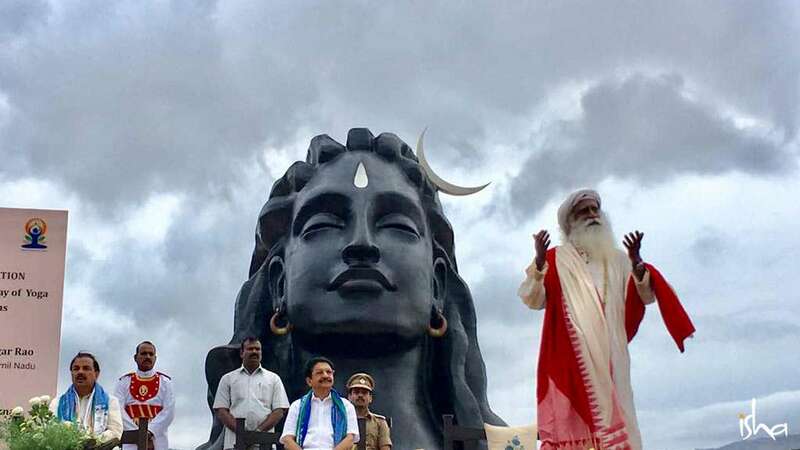 Hundreds of people from nearby villages, school children, BSF jawans and many more people from India and around the world gathered at the foothills of the Velliangiri in the early morning, greeted by the towering presence of the 112-feet face of Adiyogi. Shri Ch. Vidyasagar Rao, Honorable Governor of Tamil Nadu joined the event as the Chief Guest alongside Guest of Honor Shri Mahesh Sharma, Honorable Union Minister of State for Culture and Tourism. Under the cool and cloudy sky of the early monsoon season, the celebrations began with a vibrant Kalaripayattu performance by Isha Samskriti students. The guests together lit the “Yoga Yagna” to symbolise the commitment to take yoga to everyone in the world. Shri Vidyasagar Rao spoke about the importance of preparing a large number of yoga teachers who will be capable of retaining the purity of yoga while passing it on to millions of people. He said that in a world where everyone is going through stress, and with illnesses like diabetes on the rise, yoga provides an essential antidote. Yoga brings inclusiveness to individuals and helps them go beyond differences of caste, religion and nationality, and is therefore significant to foster world peace. As chancellor of 40 universities in Tamil Nadu and Maharashtra, the governor stressed that yoga should reach schools and colleges. He expressed that offering yoga to the youth will help them stay away from addictions and substance abuse. He suggested the idea of institutional affiliations for knowledge exchange between universities and organizations such as Isha Foundation. He said that, this year, Isha Foundation will focus on soldiers and children as part of the effort to offer simple yoga techniques to all. “About 5000 government schools in Tamil Nadu will be offered these tools for transformation throughout the year. We will also be offering it to the BSF soldiers,” he explained. Sadhguru then led a yoga session in which the participants learned Isha Upa-Yoga practices including Yoga Namaskar and Nadi Shuddhi. Through a mix of private and public sessions, trained Isha volunteers and teachers are offering these simple but powerful yoga tools to schools, government departments, and corporations across the country. Marking the International Yoga Day celebrations, today Isha Foundation conducted Upa-Yoga sessions for a variety of institutions and groups including the Indian Naval Service through their leadership establishment, INS Agrani, Coimbatore; ISRO, Sriharikota; and the Border Security Force, New Delhi, to name a few. In Chennai, an Upa-Yoga session was conducted for wheelchair basketball players in association with the Wheelchair Basketball Federation of India. Participants included national players and war veterans. Upa-Yoga programs were also offered by the foundation to the prisoners at Central Prisons across Tamil Nadu. True to the spirit of International Day of Yoga, Isha volunteers offered similar sessions in nations across the globe, in USA, Canada, South Africa, Abu Dhabi in UAE, Australia, Singapore, Germany, Malaysia, Amsterdam in the Netherlands, Belgium, Sweden, Switzerland, and in UK in Cambridge, Croydon, Woking, Wolverhampton, Swindon and Scotland. Yoga sessions were conducted at Trafalgar Square, London, with the High Commission of India, and in Machu Picchu with the Embassy of India. Isha Foundation has signed a Memorandum of Understanding (MoU) with the Border Security Force (BSF) this month which will equip over 2.5 lakh BSF personnel to learn yoga in a scientific manner through teachers trained by Sadhguru. Isha is also in the process of conducting large-scale Hatha Yoga programs for paramilitary forces across India. Isha Foundation is recognized as an accredited yoga institution by the Ministry of AYUSH and is a part of the AYUSH Ministry’s International Day of Yoga Steering Committee. After the immense impact of the first two years of the International Day of Yoga, Isha Foundation is now concentrating its efforts on offering the science of yoga with a special focus on the students and soldiers of India. Editor’s Note: Enjoy the latest news from Sadhguru, Daily Mystic Quote, simple yoga practices, chants & more, all on your mobile, with the all-new Sadhguru App! Sadhguru’s 3-day visit to Bengaluru included events at the IAS Officers’ Association and a conversation with Vinita Bali, Former MD of Britannia. Enjoy an inside look into Isha Insight 2016, a 4-day Business Leadership Intensive held at Isha Yoga Center.